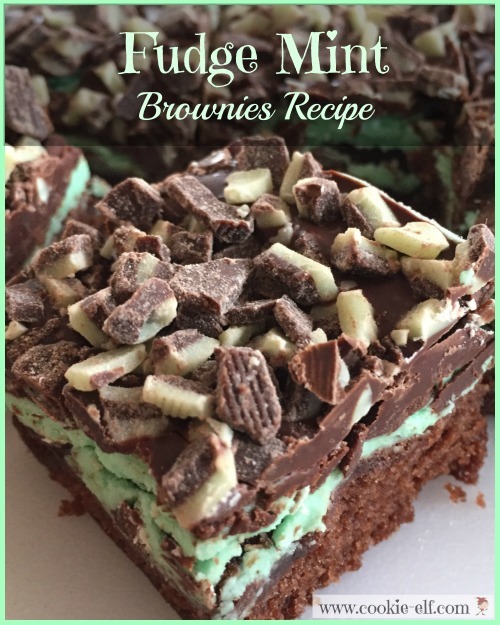 Fudge Mint Brownies recipe: it’s bar cookie. No, it’s a brownies variation. No, it’s a layer bar. Yes … it’s all three! Line a 13 x 9 baking pan with parchment paper or aluminum foil, allowing ends to drape over edges of the pan. Spray the pan liner with vegetable spray. Set it aside. Prepare brownie mix or brownie recipe according to directions. Pour brownie batter into prepared pan. Spread evenly. Bake 24-26 minutes or according to recipe directions. Do not over bake. Remove pan from the oven and allow them to cool completely. While brownies are cooling, prepare mint cream filling. In a medium bowl, using a mixer on slow speed, combine 6 tablespoons butter, powdered sugar, milk, and food coloring. If cream filling is too thick, add ½-1 teaspoon extra milk. Cream filling should be just thin enough to spread, with the consistency of thick frosting. Spread filling over cooled brownie base. Se the brownies in the refrigerator while you prepare the glaze. Use a microwave-safe bowl to melt chocolate chips or chocolate baking bar in the microwave on 50% power, stirring after 30 seconds. (Here's more baking tips for melting chocolate in the microwave.) Repeat until chocolate begins to soften. Add butter and continue to cook in 30 second increments, stirring each time until smooth. Remove brownies from the refrigerator. Spread glaze over mint cream filling. Sprinkle surface with chocolate mint chips. Baking tip: use a flat or angled spatula to press down the chips into the brownie. Return the baking pan to the refrigerator for at least 30 minutes until brownies set. Store brownies in an airtight container in the refrigerator with waxed paper in between layers. Add just 1 drop of green food coloring to cream filling. Mix thoroughly. If filling is too pale, add 1 more drop. Avoid allowing filling to be too green. Get clean cuts when you rinse knife in hot water and wipe it dry after each cut. 7-Layer Bar Cookies: So Easy - No Mixing!